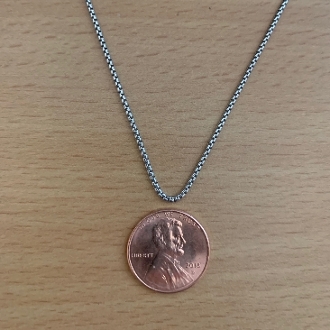 This diameter of chain is well suited for medium to smaller pendants for daily wear, and for those who prefer chains that are a little more substantial than very fine chains, yet still are not too overwhelming to the look of a design element. This is fast becoming my personal and customer favorite for a go to chain, mainly for women, but also for men who desire a finer chain type. Description: These chains are one of my favorite additions to my line in offering great quality and pricing for solid sterling chains that go very well with my work. The antique finish of this chain lends itself well to the darker contrast style of my work, blending well with the pendants and not appearing bright or glaring with a more subtle worn in tone. All sterling chain tarnishes into a softer tone over time, but this finish offers an instant match to the antiqued contrast of my designs. 1) Strength. Being in the Box Chain family, the durability of this chain type is well known, and has been a “go to” of mine forever. The clasps are normally Lobster Type, and the ends are soldered. 2) This link construction is less likely; y to snag hair stands and create issues related to this annoying aspect of chain wear. Any chain can create this issue depending on the wearer, but these are on the low end of the spectrum of this issue. 3) This chain type is much less prone to “kink or bind” which avoids chain glitches and weak spots that can arise from travel and handling issues. 4) As mentioned above, I love the “Old School” visual of these and the match to my heavily contrasted design style. 5) These chains are crafted in very many diameters and lengths, making these a flexible option for a wide variety of pendant types, sizes and structures, as well as the wide range of taste that folks have in chain weight and style. Copyright © 2018-2019 Sean's Celtic Creations. All rights reserved.